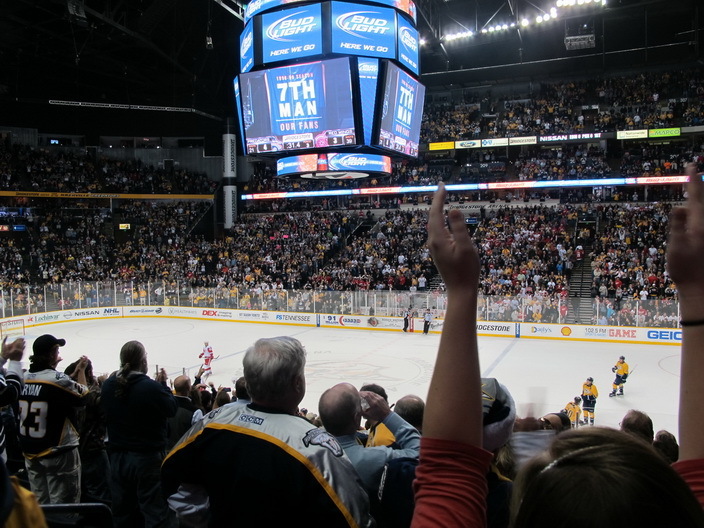 As part of my ever expanding hockey road trips, I spent last week in Nashville watching the Nashville Predators play the Anaheim Ducks, the Calgary Flames and finally, as icing on the cake, the Detroit Red Wings. Since attending the Stanley Cup playoffs in Nashville this past May cheering for the Vancouver Canucks, I have had the desire to return to Nashville for more hockey. The city is beautiful, fun and vibrant and the Bridgestone Arena is one of the best I have attended. The Predators crowd is crazy fun and LOUD!! Two of the games last week were sold out and the Flames game on a Tuesday night was very close to sold out. The Predators won every one of those games — a bit surprising since the Red Wings outshot the Preds by a huge margin, but the Preds were on a streak that week and of course, the crowd was crazy with excitement. 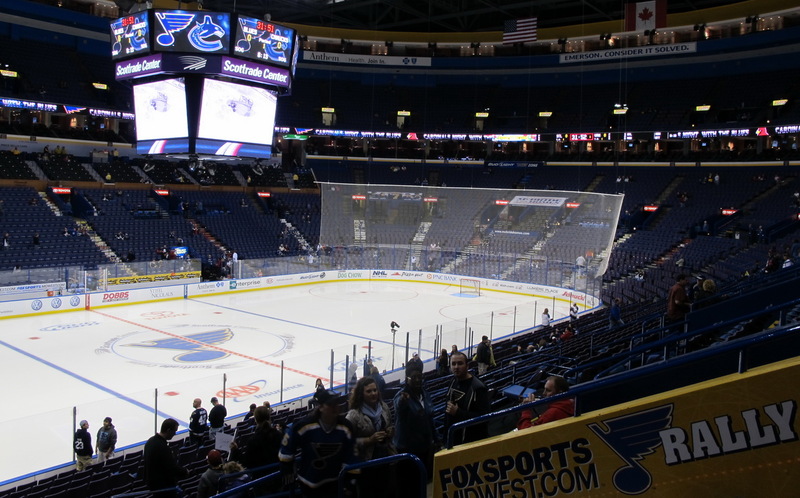 Last month I traveled to St. Louis to see the Blues play the Vancouver Canucks and was pleasantly surprised to see the Scottrade Center arena packed full that particular night. I found myself in the Blues Fan Rally Zone and was handed a large blue Number 1 finger to cheer on the Blues — yipes! Yes, I was there to cheer on the Canucks! However, I found myself sitting next to another long time Canucks’ fan and we did our best to cheer on the Canucks that night — we saw David Booth fight — but the Canucks were still struggling to fight their way out of their October and then November slump. Regardless, it was fun to see the Blues play and I was able to see Taylor Chorney with the Blues that night. Chorney had been placed on waivers by the Edmonton Oilers to be sent to the OKC Barons but he was picked up by the St. Louis Blues for a short time. When the Blues placed him on waivers Chorney was picked up by the Oilers once again and has been playing in OKC with the Barons. My next hockey road trip will be the Boston Bruins vs. Dallas Stars game on New Year’s Eve. After that, I expect to see the Vancouver Canucks again here and there — as I wait patiently for some fantastic playoff hockey again in the spring.